29-May-2018: Chinese scientists have turned copper–iodine cluster molecules into aggregated, highly luminescent nanostructures for use in light-emitting diodes (LEDs). The solid-state assemblies made of complexes of the copper–iodine cluster with phosphor–organic compounds as ligands are easily prepared, cheap, and can emit light in many colors, they report. 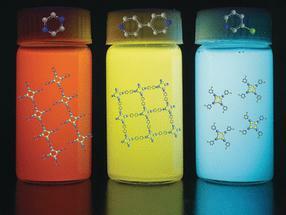 The nanoaggregates can be used as luminescent inks for invisible paintings and color coatings for LEDs. Luminescence is light emission triggered by some form of energy, which can be chemical, electrical, or radiation. For a long time, scientists thought that aggregation would be detrimental to luminescence. But in some substances, aggregation can be beneficial, researchers reported for the first time in 2001 when they observed that conformational changes turned a weak luminophore into a strong emitter. Since then, research on the so-called aggregation-induced emission (AIE) compounds has grown fast. One of the reasons: in real-world applications such as luminescent coatings and inks, the pigments usually adopt an aggregated state. The team led by Hong-Bin Yao at the University of Science and Technology of China in Hefei, China, explores the preparation routes to AIE compounds, with the goal to prepare inks on a larger scale and without a big budget. A stable cluster of copper and iodine grabbed their attention. In combination with common phosphine ligands, this cluster was known to exhibit strong luminescence in its aggregated state, the typical AIE phenomenon. But a reliable way to get to that state, let alone applications, were not reported. To prepare the AIE emitter, the starting compound must be present as a single, soluble molecule, then it is assembled and turned into something nanoparticular and non-soluble. The authors tackled the problem by employing an emulsifying–demulsifying process. By shaking the non-emitting complex dissolved in an organic solvent with a surfactant, they managed to confine the copper–iodine hybrid clusters in small droplets to obtain AIE-active nanoaggregates in a simple but effective way. The method has another advantage: when swapping the ligands of the complex, the colors changed. The scientists replaced the phosphor ligand with a set of nitrogen-containing ligands and obtained a beautiful array of luminescent inks in colors ranging from orange to blue. With which they clearly enjoyed painting: Using their aqueous inks luminescing in orange, yellow, and sky-blue, they transformed a black-and-white sketch of an underwater world into an atmospheric exquisite aquarelle visible only under UV light. Not only inks for paintings, but also color coatings for LED lamps were prepared. Normally, white LED light is difficult to achieve. Here, the researchers coated blue LED sources with yellow luminescent copper–iodine hybrids and observed the LED emission turning white. However, some adjustments still need to be made to increase the efficiency, the authors admitted.